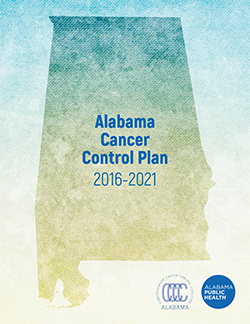 The ACCCC’s Alabama Cancer Control Plan 2016-2021 is a collaborative document that lays out long-term guidelines and objectives in order to reduce the burden of cancer in Alabama. The plan includes fundamental lifestyle changes such as elimination of tobacco use, increased emphasis on physical activity and proper nutrition, participation in cancer screenings and vaccination, and appropriate and timely treatment. It is divided into sections that address topics relevant to cancer control in Alabama. These sections are primary prevention, secondary prevention, and tertiary prevention, which includes survivorship and palliative care. Each section covers current prevalence and mortality, and selected activities and programs among Coalition members to decrease cancer incidence and mortality in the state.